A Hard Disk Drive is a crucial part of a computer because it stores the operating system of your PC. Basically, it works as the brain of the computer. It also contributes to the speed of the hard drive. Despite having a high-memory and high performing CPU, without an HDD your computer will run slow. It’s especially noticeable while using the internet. Computer lags also affect multitasking capabilities and that’s the entire purpose why high-performance Hard Drives are in demand. You can also consider upgrading hard drives for improved computer performance. 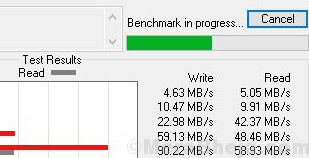 But these days you can check the speed and performance of the hard drive using a benchmarking software. The best benchmarking software is usually free to use. Here’s a rundown of some of the free tools to measure hard drive performance of your Windows 10 PC. 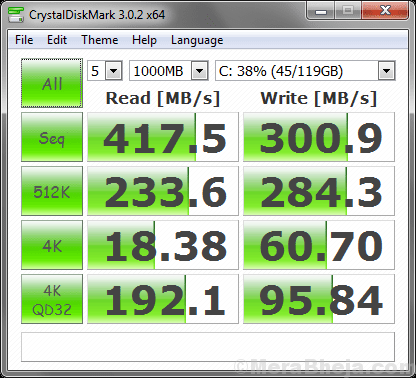 CrystalDiskMark is another trusted disk benchmark program that estimates the speed of the sequential read/write, selects test data, supports themes and multiple languages, and more. The best part about the software is that operates through the setup process pretty quick. There isn’t much to configure, except the root directory. Moreover, it helps you to get acquainted with your HDD, therefore it has the ability to estimate sequential and random read/write speeds. At the same time, it also displays complete details to user using a straightforward interface. The app is extremely user-friendly allowing all the test results to show up on the primary window. The program basically, requires just a few minutes to carry out all the benchmarks. Hit the start button after closing all the apps and you get the best results. What’s more? The program does not stress your RAM and processor a lot, however, it’s good to not have any docs open while the program carries out the test. My HDD Speed is one of the best free hard drive benchmarking tools that tracks the speed and performance of all your hard drives in real-time. It also displays the read and write activity in a small desktop window. The tool not just tracks the mechanical hard drives, but also the latest SSDs. Given that SSDs come with super-fast read and write speeds and your system is recently upgraded to an SSD, this tool would detect the speed of the new hardware also. The best part is, the latest SSDs are relatively faster compared to its predecessors. My HDD Speed is compact; however, the newer version features an installer with added software and registration as options. You can decline that and rather open the zipped file and click on it. Once clicked, a small window will open in the upper left end of the desktop. This can be dragged around the screen as well. This display that more looks like a gadget, is placed on a transparent background, so it mixes well. if your system comes with two disk drives such as boot drive as SSD, and large HDD divided into two more drives, the tool will pull up all three in chronological order. Each drive is indicated with an arrow that light up to indicate when data is read or written to the disk. Each of the lines would also indicate both read and write actions in KB/s. As you right click on the tool’s window or on the system tray image, it opens a menu that lets you run a scan again on your drives, fix the HDD refresh speed, and even Autostart with Windows, and so on. real time estimation of the internal and memory frequency of each core. It cuts off a lot of technical and manual searching and produces a list of information that’s useful for the computer fans. The interface is a lot simple with ideally no command images. The program offers rich information that looks like reading a report. Although its heavily data based, those who like attention to details will love it. From your motherboard’s chipset to the technical details of the clock, the interface comes with seven tabs. It also offers all details related to the PC memory, graphics, cache, and SPD that are easy to find. Overall, the tool features all details in tables containing highly technical names and numbers in easy to read format. The Disk Benchmark software by ATTO helps estimate performance of the storage system by running a range of tests to identify speed of the hard disk. It’s one of the leading tools used in the industry that establishes performance in hard drives, SSDs, and more. Unlike many of the benchmark tools with hosts of features and highly complicated applications, ATTO Disk Benchmark is easy to use and offers faster configuration. It comes with a simple interface, yet detailed help options with specifications for each and every feature. All its useful utilities are packed in one single window that helps pre-testing configuration to be completed in the minimum possible time. To run the test, you must select a drive you want to access, size of the transfer, total length, and then take a call if you want to utilize force write access and direct I/O. Once the test is over, the tool generates the test results in a professional manner, straight inside the main window. The results feature exhaustive graph and read/write statistics. Moreover, it also allows you to save results to a file or even get a print out. You can transfer files from 512KB size to 8MB and from 64KB length to 2GB. It allows continuous testing via time mode, while it offers several pre-defined settings through I/O option. The reports generated can be saved or printed right from within the application. You can do this using a dedicated tool that helps open a report created in the past and evaluate it on the fly. Overall, it’s one of the easiest ways to measure the speed of a hard disk. HWMonitor, a hardware monitoring software, reads a computer’s main health sensors such as, the fan speed, voltage, and the temperature. The tool also manages most common sensor chips such as, ITE® IT87 series, most Winbond® ICs, etc. It basically monitors your PC’s vital statistics that includes the temperature of different components and the existing incoming voltages. This helps keep your machine safe from any overheating possibilities or any mechanical faults. All the data captured by the software is presented in one simple presentation. Also, apart from the existing readings for all your PCs, it also shows you the suggested highest and lowest of each category to offer you a reference structure. Moreover, this software also updates all the data evaluations it shows in real-time. Overall, this program is without much added features, but it does exactly what it promises. While majority of the benchmark tools create a file on the HDD and perform the test inside the file, HD Tach works a bit differently in comparison. Latest hard drives use a zone bit recording method that permits multiple read speeds based on the data location and that’s a problem. Data located on the exterior of the drive is relatively faster than the data located inside. What’s interesting about HD Tach is that it reads from all sections of the hard drive and delivers an average speed. Moreover, it also documents the read speeds to a text file that can be noted on a spreadsheet and graph. This makes it easy to view and read the test results. While HD Tach does sequential reading, it also test’s the drive’s random-access time (actual measure of seek speed). What’s more? This tool also tests the burst speed of the drive which is the speed where the data can be accessed from the drive’s on-board read-ahead memory. This estimates the drive speed and controller interface. The registered version features write testing and supports Windows NT/2000. AS SSD Benchmark is a lightweight and handy hard drive performance measurement tool that uses copy and compression tests to analyse the performance of your SSD. It’s a simple benchmark tool with a clean user interface that shows the read/write speed of the chosen SSD in a table format. Moreover, it requires no installation and so, it does not affect the system registry in any form. It detects all the SSD connected to your device automatically and the software lets you select the one you want to test. It offers multiple test cases, viz., you can perform three tests here – the “SEQ” test, 4K test, and calculating the access time of the SSD. Your computer picks up the scores for the read/write speed along with the global score based on test results. The program also comes equipped with copy and compression benchmark tests that can offer a clear image of what your SSD can perform. You can also save the test outcomes by either exporting the data to an XML file or record it using the “Screenshot” option. Anvil’s Storage Utilities is a dynamic benchmarking tool that’s designed to offer an easy way of evaluating the read and writer performance of your HDD or SSD. The tool helps you track and analyse the unit response time and also, view the system details gathered with the WMI – Windows Management Instrumentation. You can perform a benchmark test directly by choosing a drive from the top right end of the menu. You can even check the settings first to ensure that all the configurations are set correct. Here you can replicate a compression level of the test file, e.g. database, application or uncompressed, and also check if you’d like to use the same test file on continuous runs or produce a new one each time. The software shows both MB and IOPS, which most of equivalent benchmarks do not. The program comes with a convenient screenshot button that can be used to create a screenshot of a test outcome. Also, an option to transfer the Trim command to a drive can be created. SiSoftware Sandra Lite comes with an attractive interface with a plethora of colors. The tools are neatly arranged in categories for easy access for the users such as, Computer Maintenance, Module Types (Benchmarks, Hardware, Software, Support), and Program Maintenance. The categories are placed in each tab located on top of the window matching the icons and each of these tabs offer access to a collection of focused tools. Moreover, you can choose from the comprehensive list of choices of items that can be tested. The tests are run automatically without the user being informed what is getting tested. You can easily find out devices, peripherals and processes to be tested using the options list. With this, you don’t have to wait for the software to perform a complete test using the entire system. The benchmarking and the reporting features are also commendable. Speccy is lightweight, fast, and an avant-garde system information program for your computer that helps you find what’s inside your PC. 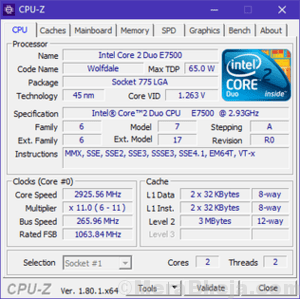 It pulls up a quick summary, or let you get a deep insight of every aspect of your computer’s hardware in order for you to make n upgrade or purchase with complete information. It offers exhaustive information on each single piece of your PC hardware. It saves the time that you would otherwise spend on looking for data related to CPU, motherboard, RAM, graphics cards and more. It also displays real-time temperatures of critical components so that you can effortlessly pinpoint issues before their occurrences. What’s more? You can also save your scan outputs straight away as XML, text files, or as a snapshot. While there are a hots of benchmarking tools available online, not every tool offers you the best results. Choose from the above list of free tools to measure hard drive performance and keep your hard drive in the top condition round the year.